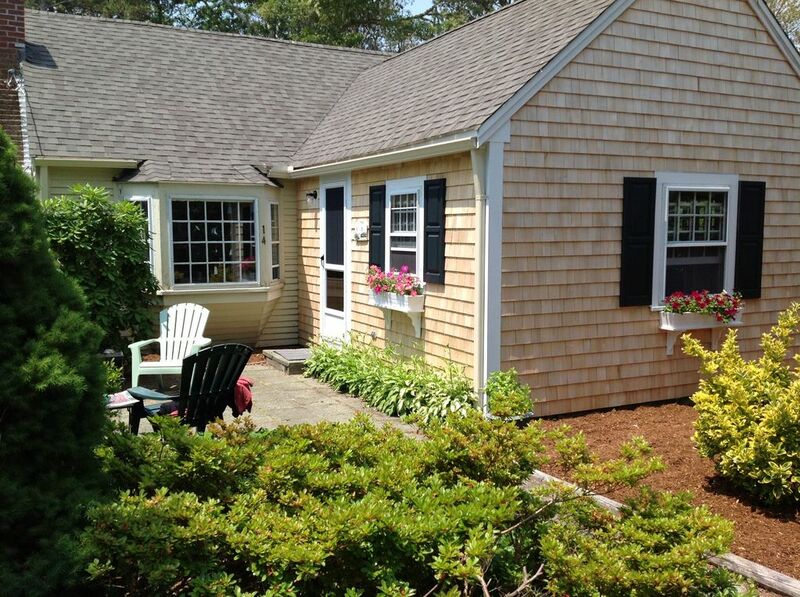 A short 10 minute walk to the beach makes this charming cottage located on a very quiet street an ideal retreat for your Cape Cod vacation. Enjoy leisurely dinners in the dining room with bay window full of colorful sun catchers that looks out on the beautifully landscaped front yard. Relax with morning coffee on either the front or back yard patio that has an umbrella table and chairs for dining. This 5 room cottage sleeps 4 with 2 bedrooms, one with twin beds and the other with a queen size bed, a large cozy living room with flat screen TV, a fully equipped kitchen worthy of any lover of cooking, dining room, one bathroom, and also an outside shower. Towels, bed linens, beach towels, and beach chairs are provided. We have three window air conditioners. We ask for no additional cleaning fee. Cottage has one bathroom with a shower and clothes dryer. Cottage also has a great outside shower. We have three window units--a large unit in the living room and one unit for each bedroom. We also have 3 or 4 fans. We provide sheets, towels, and beach towels. There is a clothes dryer in the bathroom, but no washing machine. There is a two car drive way to accommodate two cars. Very cozy with a sofa and upholstered chairs with many end tables and lamps. Flat screen TV and a DVD. An audio CD player/radio. Many lovely beach/Cape Cod themed paintings and posters. We have many serving pieces and storage containers. We will have paper plates, paper towels, napkins, and coffee filters for your use. Since we like to cook, you will find an ample supply of cooking utensils and nicely matching white dishes. Kitchen is well equipped with many good quality pots and pans, matching white dishes, variety of kitchen utensils, toaster, microwave, coffeemaker, coffee grinder, storage containers, blender, etc. You will find and oval pecan wood table with Hitchcock chairs. Pads for the table as well as table clothes and a variety of place mats. You will find about a dozen or so books--mainly novels. You will find about a dozen CDs by a variety of artists. You will find a large gas grill. Grilling utensils are in cabinet above the refrigerator. Cottage has a patio in front with chairs and another patio in the back yard that has a table with umbrella and chairs for dining and other chairs for relaxing. This property is in that ideal mid-Cape location that puts one close to many destinations and activities. The beach is a 10 minute walk. Restaurants, shops, hiking trails, bike trails are minutes away. For those with children, miniature golf, trampolines, and go-carts are nearby.